How often have we heard the plaintive refrain, "can't we all just get along?" Organizations seem prone to the development of departmental silos that foster turf wars, leading to subpar performance across the board. This distrust and disrespect is catastrophic for collaboration, creativity and for building sustainable cross-functional competitive advantages. This is especially true in the early design phase, where the creation of new ideas occurs and fostering new thinking and flexible collaboration is crucial. In other words, a newly formed partnership based on mutual respect, trust and openness. Designers and engineers depend on each other to create innovative, trendsetting and sustainable solutions for humanity. Only a few decades ago, the average design department just designed and then threw their concepts over the wall to the engineering department for the engineers to somehow make it work. Today, successful product development firms simultaneously design and engineer products from the outset, improving product quality while reducing development time and cost. When I first started in design consulting decades ago, designers would say: "Engineers are unwilling to explore new ideas" and engineers would say: "Designers keep showing up with unworkable ideas." As both a designer and an engineer, it seemed to me that there was a distinct mismatch of expectations rooted in how the participants perceived their roles in the process. First of all, the perpetuated framing of the situation led nowhere, with "designers versus engineers" fighting each other from beginning to end of the product development process. The reality is that both professions have the same goal, which is to realize the creation of new business opportunities for the client. A more useful way of framing the situation might be for designers and engineers to move forward as comrades in taking on the challenges of the creation process. First, by collaboratively defining the current reality and the team's aspirations for the project and then to work on closing the gap between current reality and their aspirations. Innovative design and engineering are both artistic endeavors that require the creative and practical implementation of a shared vision. What differentiates them can also make them into a good marriage, as their differences in knowledge and ways of thinking spark new and innovative ideas. Just putting two designers or two engineers together simply does not produce the same creative spark. Separate studies of designers and engineers at Art Center College of Design in Pasadena, California and Hanyang University in Seoul, Korea, when working on the conceptual phase; have revealed their differences and their commonality in design reasoning. 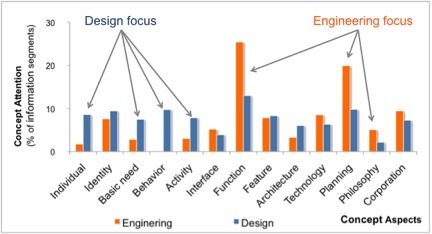 When analyzing their concept descriptions, designers were found to focus on the users' in the social context, needs, behavior and activities, while engineers focused on function, planning and philosophy. While this may come as no surprise, where they do come together is on their thinking about the users' identity, interface, features, architecture, technology and the corporate context. With at least half of the aspects in common, one would think there would be plenty of overlap for building common understanding and leveraging the difference in perspectives to create cross-functional learning on the remaining aspects. For a productive collaboration, each party needs to contribute something unique, for which they assume responsibility and accountability, as well as an overlap in areas where joint ownership seems reasonable. This dynamic balance of different and same can help inspire creative ideas, develop new knowledge and provide a close camaraderie and yes, also create necessary sparks. For, just as in any good marriage, without passion, there is no spark and no real creative process in which to move forward.